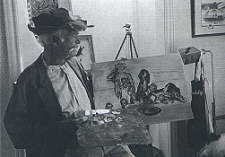 Buddy Ebsen may currently be in the forefront of celebrity art but, his love for painting began at a much earlier age. Ebsen says of his paintings, "I always had a strong interest in color even when I was 10 years old. My mother was a painter and she enrolled us in art school after we left Belleville, Illinois when I was 10 to move to Palm Beach". Buddy also states, "I love acting and I also love playing the saxophone, but for me painting is a very different experience because I do not need an audience to make it complete, the connection is between the painter and the painting, one on one". Buddy has also painted landscapes, seascapes and self-portraits. Click the link to preview a few paintings from the Buddy Ebsen Collection. Surprisingly, Buddy never intended to be an actor. His goal in life was to be a doctor. After completing pre-med studies at the University of Florida, he was unable to continue his studies and moved to New York in 1928 to try his hand at show business. 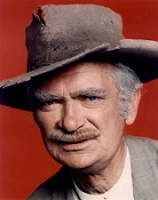 Buddy Ebsen's best known characterization is that of Jed Clampett, patriarch of that celebrated piece of Americana, The Beverly Hillbillies. His second best known is the television sleuth Barnaby Jones. To view more of his film credits and to view a video filmography featuring various movie and television roles click here.